How Long Will The Supreme Court’s Conservative Bloc Survive? Supreme Court justices John Roberts, Clarence Thomas, Ruth Bader Ginsburg and Stephen Breyer all have lifetime appointments to the court. But how long will those appointments last? Somewhere high up in the news stories (ours included) about President Trump’s new Supreme Court nominee, there’s often a sentence that goes like this: Brett Kavanaugh is relatively young, and his confirmation could therefore alter the makeup of the high court for decades to come. This article is an expanded, FiveThirtyEight version of that sentence. It is, by nature, a morbid exercise. The Founding Fathers, in their 18th-century waistcoated wisdom, decided that Supreme Court justices ought to serve for life.1 This was meant to insulate justices from certain “encroachments and oppressions” that could threaten the judiciary. But it also gives the court — and thus the laws of the land — an unpredictable flavor, one susceptible to the whims of the circulatory, respiratory and nervous systems of nine middle-age-to-quite-old people. Supreme Court justices aren’t around forever. Which leads to some questions. About how long can we expect each current justice — or the new nominee, Brett Kavanaugh — to get up and put on their black robe and sit in their black leather chair? And assuming that Kavanaugh is confirmed, how long can we expect the court’s new five-member conservative bloc to stay together? I’m not a medical doctor, and this is not a medical diagnosis of the high court. Rather, it is a rough, but statistically grounded, empirical assessment written on the back of a cloth napkin. The illustrations below are based solely on mortality probabilities from the federal Centers for Disease Control and Prevention — accounting exclusively for each justice’s gender, race and current age.2 The analysis does not take into account, for example, Justice Ruth Bader Ginsburg’s vigorous workout regimen or Kavanaugh’s fondness for spending time outdoors. The over-under — that is, the point where there are equal chances both before and after — on the new conservative majority cohort3 all staying alive is just about eight years. The over-under on the liberal minority cohort all continuing to draw breath is about five years. Justice Neil Gorsuch, congratulations: As the youngest Supreme Court Justice, you are expected to be with us for the longest. 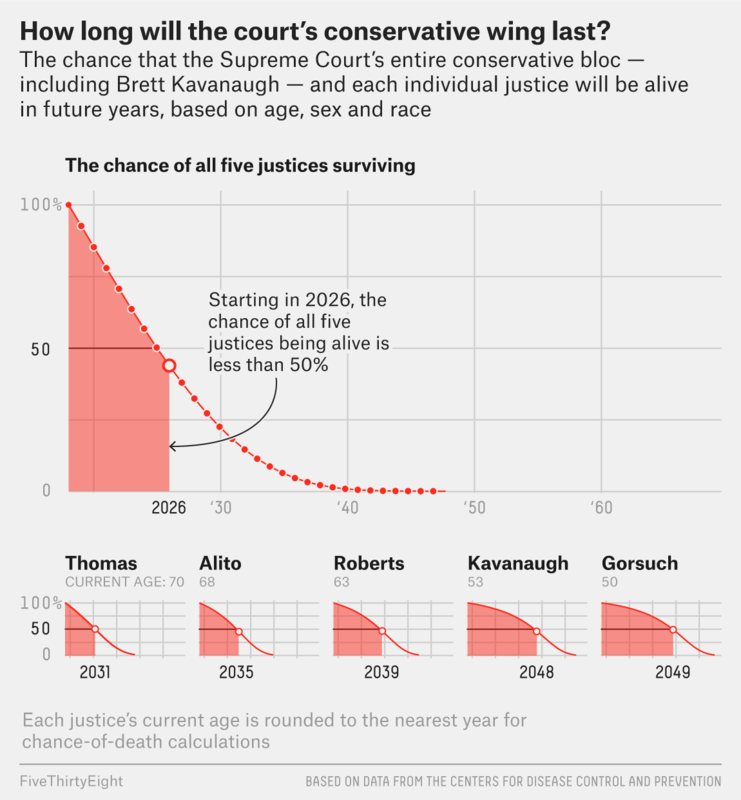 There is about an 11 percent chance that nearly-51-year-old Gorsuch is still alive and kicking in 2060 and a better than 50 percent chance that he gets to 2048. 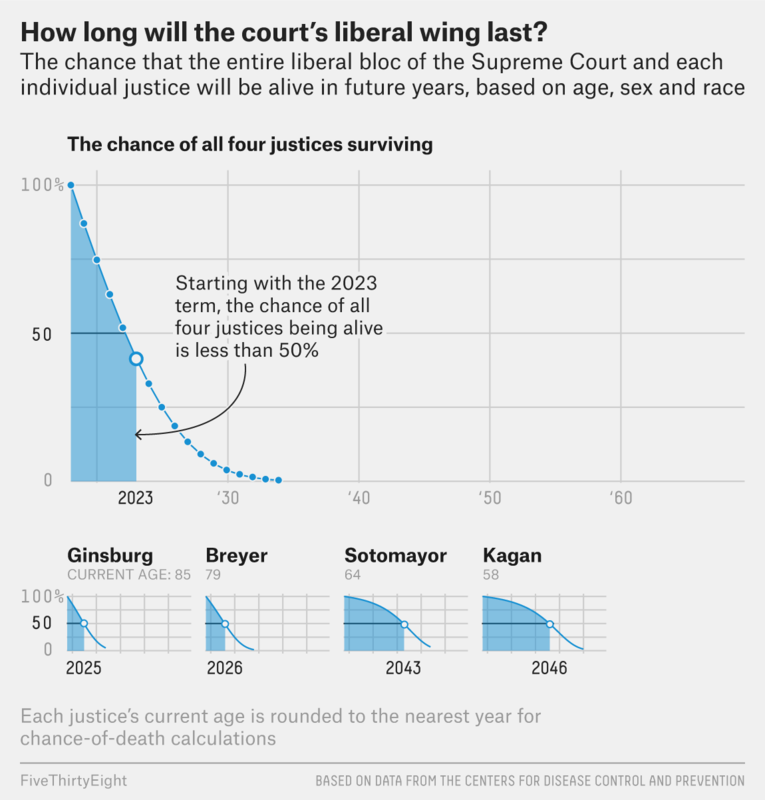 Set the over-under for Ginsburg — the oldest justice, at 85 — at around 2025. Kavanaugh, the 53-year-old would-be court alterer, may or may not make it past 2047, with about equal probability. Of course, what happens next to the court should the end befall any of these justices depends entirely on timing. If there’s a death within the next couple of years, Trump will likely fill the seat with a conservative. That means that if Kavanaugh has been confirmed and a conservative is being replaced, the court’s 5-4 conservative majority will be maintained. If a liberal is being replaced, it could mean a shift further to the right for the court. If a death happens after a couple of years, the likely outcome is anyone’s guess. That puts the average age at departure from the court at 69.7, which is heavily influenced by the average age at death: 73.9. Two of the current eight justices, both liberals, are older than that. For the purposes of the CDC survival probabilities, which are listed for whole years, we rounded each justice’s precise current age to his or her closest whole-number age. Again, assuming Kavanaugh gets on.